As has become routine in the first days of the New Year, time to consult the crystal ball to see what may lay ahead in 2019 for the Palouse Wargaming Journal. I enjoyed the notion of fighting "monumental" battles presented in 2018 whereby several battles were selected and staged for prolonged play. Mollwitz, Foz d'Arouce, and Zorndorf were the three battles tackled in 2018. While 2018 had four such battles penciled in on the calendar, only these three made it to the gaming table. From these repeated playings, I gained considerable insight into the battles and quite enjoyed the experience of research, set up, and recreation. While I was prepared to slot Rivoli into the gaming rotation for 2019, the allure of having a set of anniversary battles was too great. In keeping with the concept of an early Napoleonic battle to replace Rivoli, Trebbia will get the nod. Trebbia provides an opportunity to field a combined Russo-Austrian army against the French. There may be painting needed once an Order of Battle is drawn up. Kunersdorf (by special request) represents another chance at an anniversary battle in August. Like Zorndorf played on the 260th anniversary in 2018, Kunersdorf allows another opportunity to field Jake's Russians on the field of battle. Facing off against Frederick again, this time the Russians will be joined by an Austrian army. Napoleon vs the Archduke Charles battling it out in Bavaria along the Danube. Having visited the Eggmuhl battlefield in May 2018, staging one or both of these engagements for the 210th anniversary provides an opportunity to share a bit of my battlefield walk near the village of Eggmuhl. Recreating one or both pair of battles in 2019 coincides with the 210th anniversary of the battles in April. An anniversary game; I like the sound of that. The massive collection of Napoleonics suited for the 1809 campaign have not been out of their storage boxes in years. Eggmuhl would be a good chance to see this venerable collection back in action. The battlefield of San Martino I visited during the 150th Anniversary commemorations in 2009. A return to this battle in 2019 seems a fitting time to see this battle back out on the gaming table in an encore, 160th year, anniversary performance. While the battle will likely focus on the major action around San Martino, I may expand the battle to allow the inclusion of nearby forces. Broadening the scope of the battle may force a different decision matrix from the first outing ten years ago. Developing and fighting four protracted battles may be too much to ask in 2019. Perhaps, picking three of the four is prudent but which three? In addition to the monuments detailed above, what other games might see action on the gaming table in 2019? Topping the list of collections to get out onto the table are the Great Italians Wars and Assyrian Wars armies. Perhaps a mix of games using To the Strongest! and Impetvs in a matched pairing? If other gaming opportunities arise, that is fine. These goals provide a reasonable nucleus from which to plan. With no new project(s) planned for 2019 (yet) and no pressing need for projects needing vast quantities of figures, I set the painting goal at 900 figures and will prepare to paint what inspires me. Perhaps 2019 will see the start of an 18mm Prussian army for either 1866 or 1870? Perhaps, 2019 sees the beginning of a Hittite army to face either the Assyrians or Egyptians? Of course, these would not be considered new projects; simply expansions to existing projects. See, it is quite easy to justify such actions. Perhaps something new entirely? More 1799, 1859, and SYW troops in 18mm are planned to cross the painting desk in 2019. If the Battle of Trebbia is fought, the Russians will likely need augmentation especially in the cavalry arm. Expect more 28mm figures seeing activity at the painting desk than in 2018. With 15/18mm dominating production in 2018, a more balanced approach is likely to be seen in 2019. Regardless, The Lead Pile needs to experience a reduction in 2019 so I ought to buy less, paint more. With the Society of Ancients choosing Telamon as its Battle Day battle and the expectations of following all of the assorted Battle Reports in the coming months, I am inspired to push some 28mm Ancients lead into the painting queue. It has been a long time since any ancients of the 28mm variety crossed the painting desk. A quick check of the Paining Log confirms this recollection. The last 28mm Ancients unit passed off the painting desk in 2017. A large number of Celts/Gauls and Germans have remained untouched for years in The Lead Pile. Perhaps, some activity on the Ancients front? To exacerbate the problem with Celts, last week I placed an order with Northstar for a few Crusader Celt collections having a couple dozen figures each. What can I say, they were on sale! Scenario research, design and development are rewarding aspects of the hobby. Scenarios are needed for Kunersdorf, Trebbia, and Abensberg-Eggmuhl. San Martino will need a scenario update as well to expand the scope of the battle. Plenty of work with just these four battles. After playing Risorgimento 1859 and Wars of Coalition from QRS' exclusively for a couple of years now, 2018 2019 may finally be the appropriate time to begin codifying the rules into a coherent body of text. The nucleus of game engine for these rules began as a heavily modified version of Whitehouse's Ironsides and Old Trousers. Today, Howard's originals would barely be recognizable. Certainly! Solo gaming in both miniature and cardboard will likely consume a chunk of my allocated gaming time. A number of boardgame group sessions were shared in 2018. Hopefully, these sessions become a trend in 2019. A couple of batches of board wargames came in house in the latter stages of 2018 due to several Black Friday sales. Other games came in infrequently from eBay purchases. Some of the titles were old and out or print but a number of new and recent releases too. 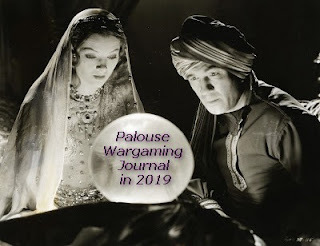 No commitment as to what should see action on the gaming table in 2019. Tackling either a new or old monster game sounds fun. A step in this direction would be to learn or relearn at least one new monster. My shelves are full of these monsters, many having not seen action in years or decades. Expect to see some MMP titles and perhaps a Europa game on the table. For MMP titles, Squad Leader/ASL, OCS, BCS, SCS, GTS or other three-letter acronym systems all look very interesting to try. Since I have yet to play either a BCS or GTS game, 2019 may be the year to try. Maybe strike out on a follow-up GMT 1914 title while that system is still somewhat fresh in mind? The Serbian front looks interesting. A number of magazine games are on my RADAR for consideration including some very old S&T and Vae Victis games. Too many interesting choices! Difficult to foresee which of these may see time at the table. Expect to see blog updates average two to three posts per week. I find that pace comfortable and seldom run out of material to share. Expect wargaming topics to be broken up by my occasional ramblings on cycling around the Palouse and travels around the world. A big backlog of travel stories still awaits to be committed to paper including a short battlefield walk of Eggmuhl and more travels around Germany, Austria, Italy, and Switzerland. Likely a few Mayan ruins' posts linger somewhere from my New World adventures too. Once the Napoleonic cavalry refit is completed, photographing the collection will be in order. Updating the Photo Gallery which was not undertaken in 2018 could see some progress in 2019. For planning 2019, that is a wrap on a look ahead. Planning is an iterative process; expect change! I admire your ability to plan in advance, as I tend to wing it when it comes to my games and projects, although this year I want to do more linked campaigns to help maintain focus. Hi Steve! Having a plan t least provides me with some direction and goals to work towards. I may not meet these goals but I have a plan. I look forward to following your linked campaign games. Sounds very interesting. I hope you make the trip to the Trebbia, Jonathan. That and San Martino would be great to see this year. Trebbia looks interesting although my knowledge of the battle is limited to Duffy's account in Eagles Over the Alps. I have much to learn before diving into Trebbia. A fine list. I would like to see an Eggmuhl game hit your table and look forward to TtS and Impetvs comparisons. A Hittite army would be splendid, though your lead pile probably already dictates that Celts / Gauls have been patiently waiting for long enough and deserve due consideration. Eggmuhl is a battle that is of great interest since the 1809 campaign has always been one of my primary Napoleonic theaters of interest. The opening stages of the Danube campaign probably offered the Austrians their best shot at victory. Eggmuhl is of particular interest having visited parts of the battlefield recently. A couple handfuls of Celts/Gauls are seeing some activity on the painting desk but beginning a Hittite Army would complement both the Assyrians and Egyptians. I wish I plan my year like you do Jonathan. I end up winging it throughout the year. Nothing wrong with being spontaneous, Ray! I will likely veer off course from plan at times during 2019 but having a general guideline is helpful to me. Obviously I am looking forward to an Italian wars game! Eggmuhl sounds great too and Solferino is always interesting! Italians Wars. Iain, I seem to have great difficulty getting that army onto the table. I should put that down as a goal! I admire your ability to set a plan and follow through on it. I can only loosely plan as my butterfly habits tend to get in the way. Thanks, Christopher. Planning helps reduce my chaos. I have butterfly tendencies as well but having a general plan in place helps me to keep somewhat focused. Looking forward to many more posts, Jon! Good! Thanks for staying on board and following my activities. I would be very interested in seeing the Battle of Solferino, Jonathan. Sort of a rarity in gaming, I would assume. It would be like the Blue vs. Red (trousers, that is). Looking forward to your future posts! Dean, Solferino, proper, will not likely see the table in 2019. I have way too many French and Austrians needed to field the entire OBs for both armies. The northern part of the Solferino battlefield at San Martino fought primarily between the Sardinians and Austrians will be the focus of this battle. I may expand it to include options for other troops to enter including the French and more Austrians. Stay tuned! I admire your ability to plan the year in advance - I am unable to do such a thing. Looking forward to your blog posts, especially for the anniversary encounters. I rate the 1809 campaign as the most interesting and hard fought one of the Napoleonic Wars. Mike, my planning sometimes does not survive contact with reality but it helps me to at least formulate a plan. 1809 campaign is one of the most interesting to me too. Exciting project plan, and look forward to seeing it come to fruition. Also good to see 2-3 blogposts per week planned. I have been able to surpass my original intent of 1 post per 'month' on mine, by getting an average of 2/month this year. I am labeling this momentous event as 'progress'. Glad to see the 2019 plan holds something of interest to you! I have been holding steady with a blog post every three days a a few years. That frequency seems to work for me, for now. Doubling your number of blog posts IS progress! Keep at it! A promising year--looking forward to following along. Your list of prospective major battles/games is impressive. For what it's worth, I would find Kunersdorf and San Martino-Solferino of extra interest. Glad to have you following along, Ed! Kunersdorf will be a good opportunity to see Jake’s Russians back in action. Probably set Kunersdorf for August near the the battle anniversary date. I look forward to San Martino as well. It provides an interesting tactical situation for both. Everything sounds great, Jon. We found Eggmnuhl quite challenging to balance, and it took us three tries to get a viable scenario (which is in the "Blunders" Scenario book). Abensburg is interesting, although once again some "What if's" and/or play balancing will likely be needed. Eggmuhl poses a lot of challenges for the Austrians. Perhaps one solution is to expand the battle to include a bigger area of operations? I will see what I come up with to make a competitive game once I have done the proper research. Bravo on your plan to get the Napoleonic forces out on the table! Thanks! It will be fun to see two distinct 18mm Napoleonic collections in two different battles. A nice range there Jonathan, and I too will be looking forward to the Eggmuhl scenario. We will see what I come up with regarding Eggmuhl. Hopefully, I can build a compelling situation for both the French and Austrians. Thanks! I may need some luck. Good stuff. I am looking forward to participating in some of these games. I may even try to actually host a couple myself this year. Good luck with your plans for 2019! Thanks, Simon! I may need some luck. Plan, yes. I am more concerned about execution. An excellent set of plans for the next year. I really enjoy the series of posts covering the battles, as I learn a lot as well (not being a lot of knowledge about naps myself), plus’s i like the look of battles in 18mm. Hi Stew! Glad to see that you are enjoying the content of the blog! When considering which battles to focus attention on in 2019, I was surprised to see that all of the anniversary battles would be fought out in 18mm. Maybe I should have spread the wealth to other scales (sizes) but decided to stick to fighting big battles in 18mm. I like the look of battling it out in 18mm too. Thank you for your kind comments and support. Both are much appreciated! Sounds like you are going to have your hands full over the next year Jonathan. Hi Pat! Busy, for sure. With luck and effort some of this may come to pass. Many goals and a single year...good louck! I may need a little luck to get this all done.